Copyrighted in 1928 and again in 1934, this song has been sung by thousands of mamas to their babies. "Mama's little baby loves short'nin', short'nin', mama's little baby loves short'nin' bread!" 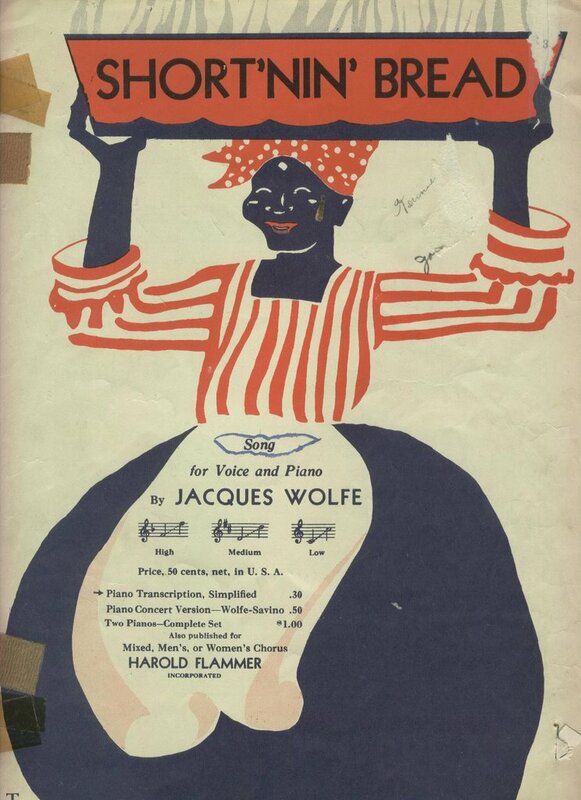 This sheet music has value as a black collectible as well as historic value from the late 20's on. NOTE: Can anyone tell me why links are no longer active when I put them into the blog? Or why you can't change the color of the print or justify anymore? I love this cover...it's so retro and yet, as you said, a 'collectible'. I haven't expeerienced the problem you mention yet...but I haven't created a new post since early yesterday A.M (March 30th). Has this happened since then? Maybe it's something in good old Blogger??? UGH! Are you using the little world with the link symbol in it? Then you just paste the URL in the little window that shows up and click save. The HTML tags have to be there to make it work. I don't know. Mine work when I do it that way. Here from Michele this time. I do remember this song. Mom sang it to me. That is really a vintage music sheet. I remember that song well. When I saw the picture I immediately thought of a resturant that was here just over 30 years ago, called "Sambo's", which completely changed it's name and promotional materials. They made the best flapjacks. I have no idea about the links issue but nothing would surprise me too terribly much anymore with Blogger. I almost wish they would charge a small fee just to keep everything up and running; it's be worth it and it might dissuade some of the spammers, etc. Sorry, should have addressed your post first! This song was sung many times in our household ... I remember it well. What a great little snippet from American history. I believe they became "No Place Like Sam's" when it dawned on them that the original name was no longer PC. My wife's great aunt used to sing her this song. Powerful memories in this music. After you paste or write your text in Blogger, select a word(s) then click the little Link icon. A pop-up window will let you type or paste the URL. In this case, I would have chosen the word "here." So, you have to have your URL copied and ready to paste. When you open your new post, the word(s) you selected should be in bold or in another color or both. Your readers click that and off they go... No need to type the URL directly into the text. I still sing the lyrics to that song when I hear Dave "Baby" Cortez' instrumental version: "The Happy Organ." As for Sambo's mentioned in the comments above, I never heard of "No Place Like Sam's" as mentioned by Carmi, but I know the story. ...Because of group of blacks protesting the name Sambo's as an alleged reference to the old story "Little Black Sambo," the name was changed to "Flying Tiger Restaurants." In fact, the name had no connection to the story, but rather was a the nickname of the chain's founder. I don't recall his first name, but the last was Samborini, and his friends called him Sambo. He eventually went bankrupt and far as I know so did the corporation. ...It is said that is was the first so called "PC" protest. ...One week my family and I ate at Sambo's. The next week it was called Flying Tiger. The restaurant DID in fact have reference to the story Little Black Sambo - and the walls were decorated with artwork of Little Black Sambo. My grandmother was a waitress there, and I spent many an afternoon there.